How I Did Bogota, Colombia for $126! So I was supposed to be relocating to a new city for the past two weeks but things kept coming up! Then... I found a deal to Bogota, Colombia for $187 roundtrip. I figured it was pretty inexpensive, I have never been to Colombia, and why the hell not? After it was all said and done, I ended up going to Bogota, Colombia for $126! This is how I did it (and you can too). From reaching out to a few friends who are from Colombia and some reading about the country, I knew that a three and a half day trip to Colombia would be pretty inexpensive. 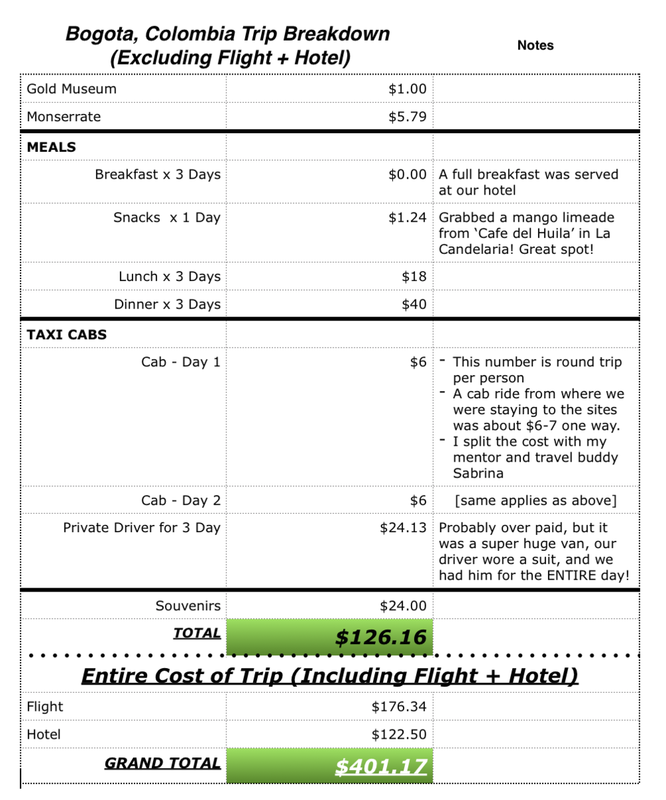 Utilizing my handy dandy travel budget template, I decided to budget $150 for spending money for the entire trip, as a personal challenge. Obviously, I had some contingency funds, but I wanted to see if it could be done. And it can be, and I will show you how! Before I get into that, let me just say that my experience in Bogota was phenomenal! The people are very hospitable and inviting. The city of Bogota was very clean (at least the parts we explored), and a little-known fact to the rest of the world - Bogota has some of the most amazing street and graffiti art! One reason being, it is legal! There is a free walking tour you can take that is about 2.5 hours. It was honestly the best part of my trip. 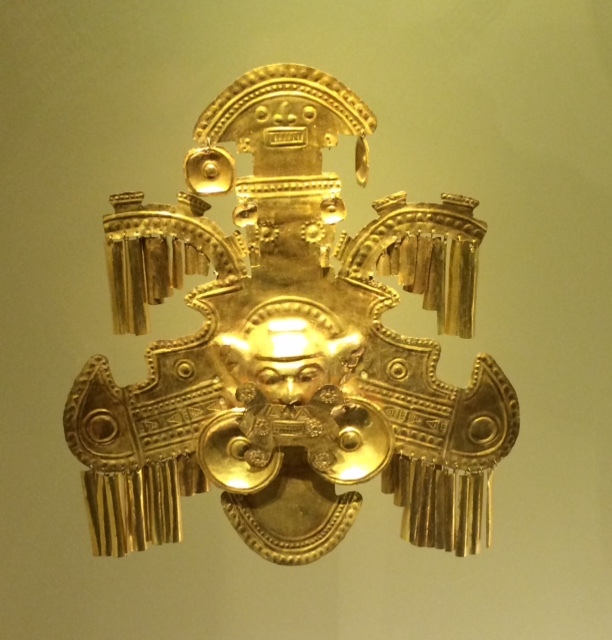 + The Gold Museum: At the time of writing, Museo de Oro was COP 3,000 (~$1). If you read the excerpts or do the free museum tour, you will learn a TON about Colombia’s history, especially before being conquered by the Spanish. + FREE Bogota Graffiti Art Tour: One word- AMAZING. This was my favorite part of the trip, hands down! I won’t spoil it with too many details, but I will say that street art is not only beautiful in Bogota, but we know art tells stories. Street art in Bogota is used as a platform for political protests, snapshots of history, and stories about current political and socio-economic issues in the country. + Take the time to visit Monserrate. It is a beautiful mountain, with gorgeous views of Bogota from the top! You can take a train or cable car up! I have heard you can walk up, but that was completely out for me. The cost was COP 18,000 (~$6) for the train to the top of the mountain. + If you have the time, visit the Salt Cathedral of Zipaquira or Cathedral de Sal de Zipaquira. You can take the bus here, but we hired a driver for the day that took us. It is a little over an hour outside of Bogota. + Bring wet wipes and toilet paper with you! You may have to pay for toilet paper in public restrooms. ALSO, do not flush toilet paper down the toilet! It backs up the pipes. This, however, is true in most South American countries. + Most of the cabs I rode did not have seat belts! Make sure your Prayer Life is in order! Traffic and the drivers are insane. + When shopping in open air markets - NEGOTIATE. + If you want to be in fun, eclectic, colorful area with lots of shops and restaurants, then you should look into hotels or hostels in La Candelaria. This is a sort of 'hipster' area where you are just walking distance from Monserrate, the free walking tour, and lots of bars. If not, then staying near the airport is also a suitable option. Cab rides to La Candelaria from the airport area was only ~$6-7 each way. Now that that’s out of the way check out my entire trip breakdown below. No BS, I did Bogota, Colombia for $126! Now, who says international traveling isn't affordable?! 8 Badass Ways to Travel & Make Money!